The article refers to Kaspersky Security Cloud — Family and Kaspersky Security Cloud — Personal. Criminals can access your webcam to spy on you. With Kaspersky Security Cloud, you can limit access of applications to your webcam. By default, Kaspersky Security Cloud blocks access to the webcam for applications that have been assigned High Restricted or Untrusted status. For information on these statuses, please refer to this article. When such applications try accessing your webcam, you will get a notification where you can allow or deny access. If you want to deny access for all applications, you can do it in Kaspersky Security Cloud settings. 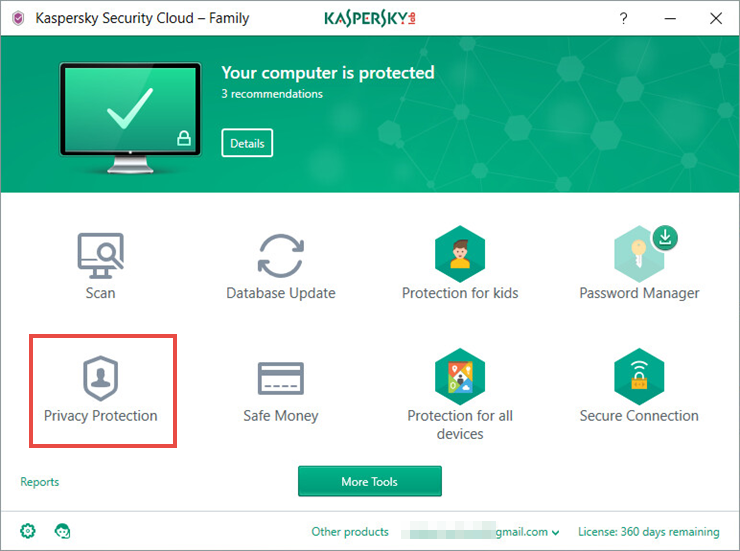 In the main window of Kaspersky Security Cloud, click Privacy Protection. 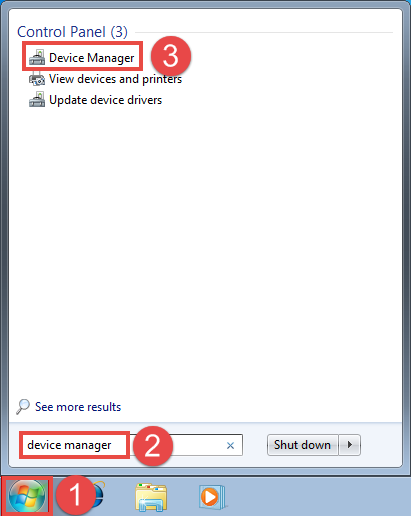 For te guide on how to open the application window, see this article. In the Privacy Protection window, click Deny in the Webcam Access section. 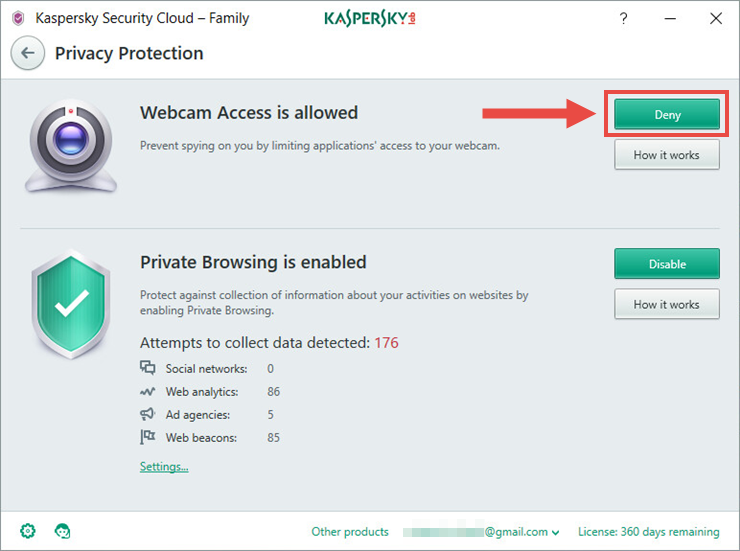 Kaspersky Lab does not guarantee the support of webcams that are not present in the list above. Connect your webcam to the computer. If there is a switch on the webcam, turn the webcam on. 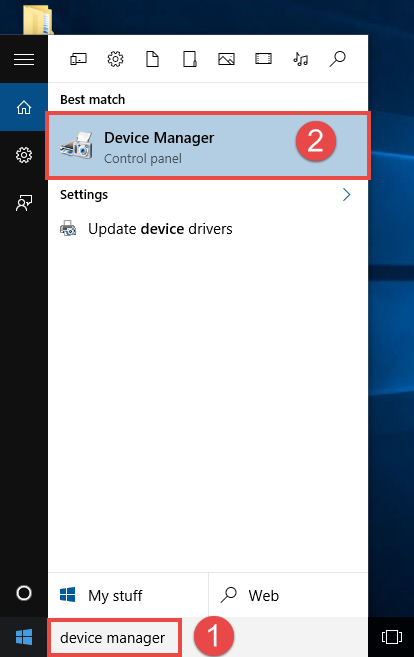 In the window Driver File Details, check if the Driver files list contains the file %windir%\System32\drivers\usbvideo.sys (%windir% stands for the catalog to which the operating system is installed). If the file exists, then Kaspersky Security Cloud supports control of access to this webcam. 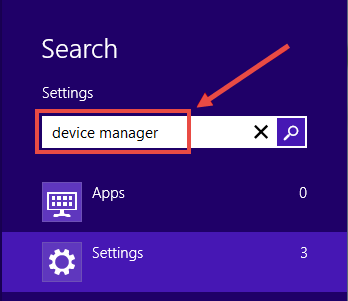 The webcam is UVC-compatible; it does not require the installation of a special webcam manufacturer's driver and supports built-in operating system drivers. Webcam vendor provides their own driver that works via the USB or IEEE1394 interface and registers the webcam as an Imaging Device. Kaspersky Security Cloud cannot control access to the webcam when the Prompt for action permission is set for the application that tries to access the webcam, and graphic interface of Kaspersky Security Cloud cannot be displayed (the application is loading or not responding).